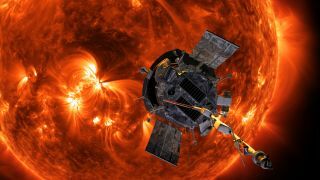 An artist's depiction of the Parker Solar Probe, scheduled to launch in early August, approaching the sun. The sun will come out tomorrow — but before it does, a spacecraft will lift off from Florida aboard a massive rocket, on its way to learn our star's secrets. That mission, called the Parker Solar Probe, is currently scheduled to launch tomorrow (Aug. 11) at 3:33 a.m. EDT (0733 GMT) from NASA's Kennedy Space Center (KSC) in Florida, and you can watch the launch live on Space.com beginning at 3 a.m. (0700 GMT), courtesy of NASA. But to get there, the spacecraft needs a powerful kick deeper into the solar system, which will be provided by a two-stage United Launch Alliance (ULA) Delta IV Heavy rocket and a third stage manufactured by Northrop Grumman. KSC won't be open to the public during the launch because of the early scheduled liftoff, according to NASA, so your best option is to watch the launch online. Assuming all goes well, here's how events will play out early Saturday morning. At 3:25 a.m. EDT (0725 GMT), Omar Baez, the launch director at KSC, will conduct the last poll to make sure all systems are ready for launch. The United Launch Alliance Delta IV Heavy rocket built for the Parker Solar Probe, as seen during launch preparations in April 2018. Almost 4 minutes after launch, the booster rockets will separate from the main rocket, and the first stage will separate a little less than 6 minutes after launch. The fairing that currently surrounds the Parker Solar Probe will separate shortly thereafter, leaving the spacecraft ready for its continuing journey. Then, 37 minutes after liftoff, the second stage will separate, and a short burn of the third stage will follow, NASA officials explained. The probe itself will separate from the rocket 43 minutes and 18 seconds after launch, ready to journey on to the sun. The spacecraft will swing by Venus to adjust its orbital pathway in late September, which will put it on track for its first close orbit of the sun in early November. The Parker Solar Probe is scheduled to complete 24 petal-shaped orbits between now and mid-2025, when its primary mission will end. If the spacecraft still has fuel, its creators hope to keep gathering data until that fuel runs out. The Aug. 11 launch window will remain open for about 65 minutes, NASA officials said. If the mission can't launch in that time window, a similar window will open Sunday (Aug. 12) at 3:29 a.m. EDT (0729 GMT). Daily windows will continue through Aug. 23. Yesterday (Aug. 9), NASA officials said at a news conference that the weather forecast suggested a 30-percent chance of weather interfering with the launch on Aug. 11, with a slightly more ominous 40-percent chance of weather troubles on Aug. 12. Visit Space.com Saturday for complete coverage of NASA's Parker Solar Probe launch.